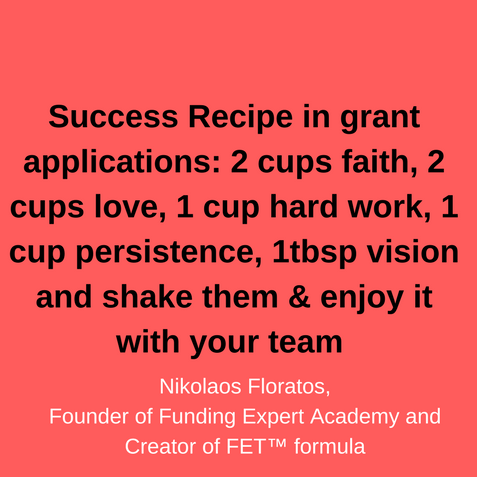 In this training video, I reveal the 8 steps to be followed for developing successful grant applications. 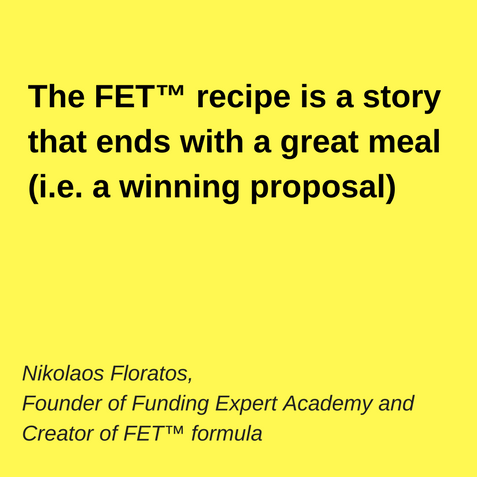 Since in order to create a great meal, you need to start with a recipe, in the same manner in order to develop a great proposal for funding, you need a “recipe” and that is my well establied FET™ formula that is based on the practices that all champions are applying in common for developing their winning proposals. 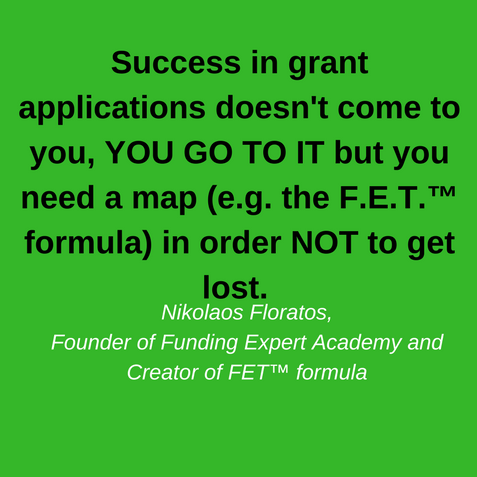 The FET™ formula is based on years of studying or working with the champions in european funding in key areas such as in entrepreneurship, research&innovation, education, human rights, culture, etc. Influenced also from my PhD research, I have realised that “success leaves clues” and all successful people in any specific area follow a similar pattern of actions and mentality that makes them successful in their area. 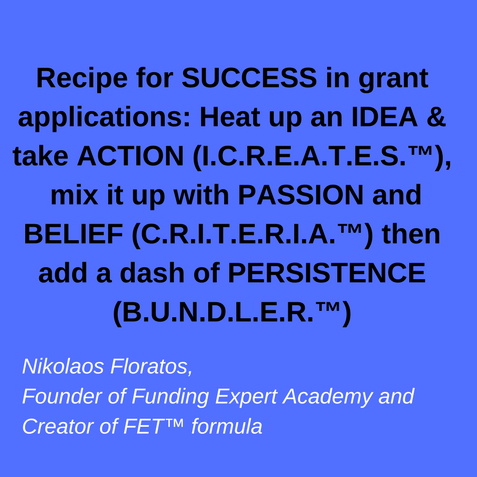 My job in european funding was to recognise this pattern and create this common framework (FET™ formula) of steps and actions that lead them to the consistent development of winning grant applications. Stage 1: Identify the most suitable EU funding programmes for your organisation or your client(s). There are around 1 trillion € available from the EU budget for the financial programming period 2014-2020 to fund and support activities across the European Union (and not only) that will lead to three priorities: a) the creation of forefront knowledge, b) the increase of growth and more jobs and c) the improvement of quality of life. 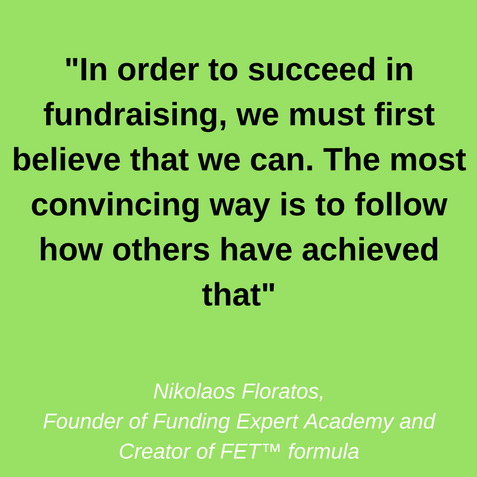 Therefore, there are many different funding opportunities that anyone can get really lost and miss which funding opportunities are the most attractive, most suitable and most promising for your organisation and your clients. There is a technique that we should follow which is called Five Fingers’™ Technique that allows us to identify easily the most appropriate calls for our organisation and clients according to their ambition, activities, size, reach, mission, and vision as well as to the success chances that we have in each programme. Approach, that is the implementation methodology and the work-plan. These all above are mastered with my C.R.I.T.E.R.I.A.™ formula. Ok, there you have it – the Funding Expert Transformation Process™ Formula. In the following video, I reveal with more details the I.C.R.E.A.T.E.S. ™ formula (the 2nd stage) that is the 8 steps for submitting successfully a proposal. Enjoy it!